Various programs and services provided by UCM include: community service, pastoral and crisis support, Sunday dinner meetings, worship, hot topic discussions, interfaith dialogue, study related to faith and spirituality, mission trips, social events, weddings and premarital preparation, memorial services. The UCM also has an important role on the University of Maryland campus, representing the spiritual dimension of life. Vital campus partnerships have included: The Office of the Vice-President for Student Affairs; the Department of Resident Life; the Counseling Center; the Health Center; the School of Music; the Suicide Awareness Health Education Training Advisory Board; the Wellness Initiative; the Sexual Assault and Relationship Violence Prevention Committee; Campus Chaplaincies, Interfaith working group, Office of Diversity and Inclusion, (Interfaith/Secular Dialogue) Words of Engagement Dialogue Program. United Campus Ministry is a 501(c) 3 organization supported by the Presbyterian Church (U.S.A.), the United Church of Christ, and the Christian Church (Disciples of Christ), individuals and local churches. United Campus Ministry is a university recognized chaplaincy under the Division of Student Affairs. Rev. 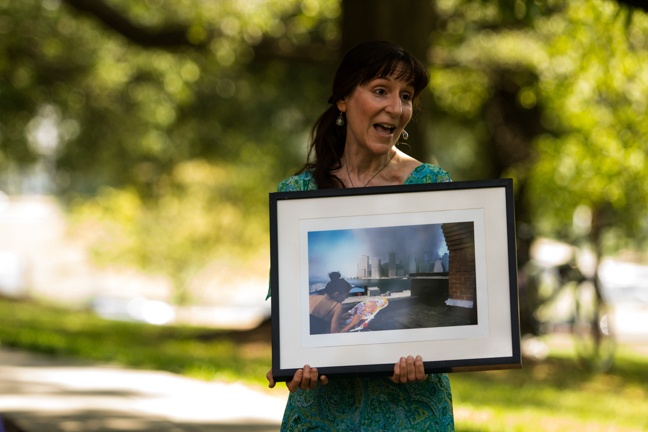 Holly Ulmer of the UMD Memorial Chapel tells her 9/11 story to a crowd of students and faculty members at the Interfaith Reflection held September 11th, 2014 at the Memorial Chapel. Originally from Long Island, New York, Holly Ulmer is an ordained minister in the Presbyterian Church (U.S.A.). Holly received a B.A. in Music and English from Bucknell University, and a Master of Divinity Degree from Princeton Theological Seminary. As a pastor, Holly finds joy working with young adults and considers it a privilege to minister to and with students as they journey from “inherited” faith to “owned” faith during the challenging college years. She regularly teaches a one-credit Interfaith/Secular Dialogue Course that has a social justice component and gives young adults skills for building relationships with others who have world views very different than their own. For 10 years Holly was a member of National Capital Presbytery’s Anti-Racism Task Force. She is a member of the National Campus Ministry Association (NCMA), and created and coordinated the worship services for the 2010 annual conference. Board Certified with the Association of Professional Chaplains, Holly also has served as an on-call Chaplain at Holy Cross Hospital in Silver Spring. Two of Holly’s favorite things are singing and playing the violin.